Whitehill and Bordon now have a dedicated Heritage-Project officer, thanks to a £10,000 Heritage Lottery grant. The Woolmer Forest Heritage Society has appointed Dr Anne Sassin to help it to promote the heritage of Whitehill and Bordon through site visits, training and workshops. On top of this, Dr Sassin will work with community volunteers and organise "Heritage Days" and other events. "We are delighted that Dr Anne Sassin has agreed to work with the Woolmer Forest Heritage Society to promote our image so that current residents and newcomers to the area will be able to connect with the past and feel a sense of belonging"
The project is aimed at promoting the town's heritage during its regeneration. "The Woolmer Forest has a wealth of heritage from prehistory to the 20th Century which needs to be both protected and promoted among the local community." "The first step of this process is to raise awareness and appreciation of the unique sites and artefacts, and we hope to work closely with the residents and developers of the Whitehill and Bordon area to achieve this end." "Sharing Heritage (a Heritage Lottery Fund grant) is a wonderful opportunity for communities to delve into their local heritage and we are delighted to be able to offer this grant 'To Protect Our Heritage into the Town's Regeneration' (the name of the Heritage Society's project) can embark on a real journey of discovery"
"Heritage means different things to different people and Heritage Lottery funding offers a wealth of opportunities for groups to explore and celebrate what is important to them in their area." An honorary "Research Fellow in Archaeology" at Canterbury Christ Church University. Project Coordinator at Surrey Hills "Tales and Trails of the Tillingbourne Valley"
Project manager for "Finding Farnham Community Archaeology Project"
You can visit some of Dr Anne Sassin's previous projects from the links below. 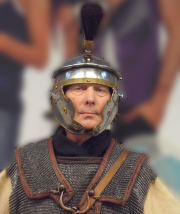 Today TWO talks were given by John Smith (above) about "The Romans in Bordon" at the Library ( who are also hosting a display of roman finds in our display cabinet ), and "The Roman Battle of Woolmer" at the Forest Center in the evening. A very knowledgeable speaker with a fantastic Q&A after each lecture. Both talks were very well attended. We have appointed a "Heritage Officer" to represent the society to people like the "Bordon and Whitehill Regeneration Co."
This is a fundemental position in ensuring that Heritage gets the recognition it deserves in all the phases of the building work over the next few years. On the icy Saturday morning of February 18th 2017 a group gathered on The Shipwrights Way, near Longmoor Camp, on the spot where, almost 2,000 years before, a Roman road had run. Rewind almost 2,000 years - to the aftermath of the Roman invasion of AD43 - and those who trod the spot would largely have been Roman soldiers, marching between the important towns of Chichester and Silchester, and traders, travelling from one place to another to sell their wares. On this Saturday it was members of Whitehill and Bordon's "Woolmer Forest Heritage Society" who stood, with others, to witness the unveiling of two signs to mark where the roman road would have been. Organised by Woolmer Forest historians Chris and Bill Wain, and paid for by a grant from East Hampshire district councillor Adam Carew, two signs were erected on either side of The Shipwrights Way to indicate where the four-metre wide route of the Roman road crossed the path. With the ribbon between the new signs cut by Lt Col (Retd) Philip Green, from Longmoor Camp, the location of the Roman road had been identified by archaeologist George Anelay. Mr Anelay, of Liss-based West Sussex Archaeology Ltd, was employed as the archaeologist during the creation of The Shipwrights Way route - a walking, cycling and horse-riding path from Bentley in the north to Portsmouth Historic Dockyard in the south. The archaeologist said there had been no Roman finds made during the creation of The Shipwrights Way, but he had located the route of the Roman Chichester to Silchester road from patterns in the soil. "We knew the Roman road came about here roughly," adding that erosion on the eastern side of the A325 had removed visible traces of it at ground level. "On the other side of the A325, there are two huge ditches on either side," he added, explaining that the Roman road route was clearly visible on the western side of the A325. The Roman road at the point of the signs (on the eastern side of the A325) would have stood about 30ft (nine metres) above current ground level before it was eroded, town historian Mr Wain said. "Under our feet is white sand," said Mr Anelay, explaining how the route of the Roman road was identified where ground-level evidence had been eroded away. "Soil-filled stripes run across the sand. Two larger stripes may have been the routes of the two ditches on either side of the road.". Mr Anelay said the identification had been made harder by the presence of "a number of Medieval trackways all coming together" at the site. The site near Woolmer Pond (the largest ephemeral pond in western Europe, according to Mr Carew), as well as being home to a Roman road, was also the location, or thereabouts, of a Roman battle. "The Romans invaded Britain in AD43 and during that first century they built many roads across the land," Mrs Wain told the assembled crowd. "A second-class road, of some 39 miles, was built from Chichester to Silchester, crossing our parish." It left Chichester in a straight line as a typical Roman road for two miles, but rapidly hit rivers, marshy ground and the steep escarpment of the South Downs. A slight diversion eastwards to a better route meant that the road came through Longmoor Camp, along Roberts Road and Methuen Road. It then curved around Woolmer Pond to pick up a straighter line across to Blackmoor House, Alton and a posting station at Neatham. Much later, by 296AD, the then Roman Emperor Maximian learned that a lieutenant called Allectus had taken control of Britain. The emperor appointed his heir Constantius to defeat the usurper and take back control of the country. Allectus assumed that the imperial Roman army would land in Kent but Constantius sailed from Boulogne (France) and split his army into two. He sailed his half to the Thames and sent the other half, under Asclepiodotus, to the Solent. This section of the army marched to Winchester and then along the Roman road towards London. At Neatham they turned towards Chichester and met, at Woolmer Forest, Allectus' army marching back from Kent. Here the usurper Allectus was killed and his troops scattered. As a result, many Roman coins have been found in Woolmer Pond and a hoard of nearly 30,000 coins and artefacts were unearthed during the building of Blackmoor House, some of which are on display in a cabinet at Bordon Library. There seems to be little dispute that a battle took place in the area in AD296. "One day we'll find the battle site," said Mr Carew who is also a town and county councillor. But there are different opinions over whether the hoard of Roman coins discovered at Blackmoor House had been intended as the pay chest for Allectus' defeated troops. Two pots, containing 29,773 coins covering the period from the emperor Gordian I to that of usurper emperor Allectus, were found near Blackmoor House in 1873. While building Blackmoor House, after he bought the Blackmoor Estate in 1865, the 1st Earl of Selborne, Roundell Palmer uncovered other Roman finds which included an urn containing bones and an enamelled bronze cup ( the Blackmoor beaker now in Alton's Curtis Museum ), bronze sword and spear heads and another pot with 100 coins. "This was Allectus' war chest," said Mr Carew of the 29,773 coins, adding the money was intended to pay Allectus' soldiers. But the 4th Earl of Selborne the Rt Hon John Roundell Palmer, who was also at the unveiling of the signs, disagreed. "Thirty thousand pennies would not have been enough to pay off an army," he said, adding that it was more likely to have been a farmer's savings in this era before banks. The earl's views are echoed in Selborne historian Edward Yates' book Knights, Priests and Peasants: A History of Selborne (2009). "The dead of Allectus' army would have been stripped down and thrown into a pit or left for wolves and wild pigs," the historian says. "With two major armies moving towards London from somewhere near Portchester, anyone with money or valuables living along the route would have been sensible to hide their possessions and retreat to the forest." The Roman road would have been "in the middle of nowhere", according to Mr Anelay. "Hoards are usually in the middle of nowhere by definition," he added. Mr Yates, who was not at the unveiling, also believes there is a Roman villa waiting to be unearthed in the area of Selborne, Blackmoor and Oakhanger. Mr Carew agreed, arguing that "the Romans had them at certain distances along the road" which meant that one might be expected in the area. However, despite the Roman finds there, he said there was no evidence that Blackmoor House was a location. "We thought that ( Blackmoor House ) might be an idea, but there is no evidence of a villa there at Blackmoor House," Mr Carew said. Maybe one day a villa will be found in the area (like that found in nearby Liss), along with the site of the Battle of Woolmer.